After the standoff between veteran quarterback Carson Palmer and Cincinnati Bengals owner Mike Brown, the Bengals were considered to be a team that was doomed at the quarterback position for at least a few years. Without Palmer under center and the two best wide receivers leaving town (Chad Ochocinco and Terrell Owens), the Bengals’ offense was thought to be awful and in some serious trouble with a rookie quarterback leading the way. Now that the Cincinnati Bengals had drafted Andy Dalton out of TCU, the rookie gunslinger was forced into the starting role right out of the gate. Whenever this happens in the NFL, disaster soon follows with the rookie getting crushed by opposing defenses and not being able to keep up with the speed of the NFL game. Fortunately, Andy Dalton has adjusted to the NFL level much faster than anticipated and struck up some much-needed chemistry with fellow rookie wide receiver A.J. Green out of Georgia. With Dalton and Green quickly becoming one of the NFL’s most lethal combinations, the Bengals have really surprised people around the league this season as they are unbelievably in the hunt for the AFC North division title. Despite not playing two of the best teams in the AFC North in the Pittsburgh Steelers and the Baltimore Ravens, the Cincinnati Bengals look like they will be able to contend with the best of the best within their division and might be able to shock the league by eventually winning the division title. Next week the Bengals will face their toughest test yet as they will square off against Ben Roethlisberger and the Steelers, but this week they had to get by the Tennessee Titans that have also been a surprisingly good football team this season. Coming into the Week 9 showdown with the Titans, the Bengals had won four straight games and looked as if the team had hit their stride. Even though it could have been argued that Cincinnati was the better team coming into this game, Tennessee was given the edge and favored to win by a same margin (-3). 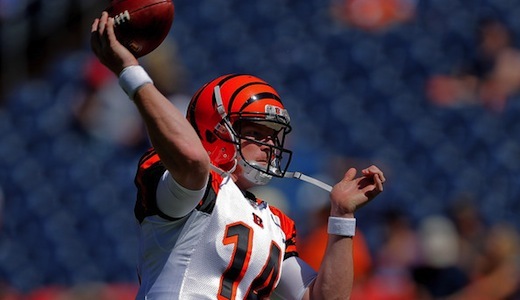 This may have been a fairly even matchup between two up-and-coming teams in the AFC Conference, the Cincinnati Bengals ultimately proved to be the more complete team with Andy Dalton leading the way with arguably his best game in the NFL thus far. With 217 passing yards and three passing touchdowns, Dalton led the Bengals to their fifth straight win of the season and an impressive 6-2 record. Veteran quarterback Matt Hasselback led the way for the Tennessee Titans finishing with 272 passing yards and two passing touchdowns and superstar running back Chris Johnson was able to breakout of his funk with 110 total yards, but it wasn’t enough to get passed a very good Cincinnati Bengals squad, 24-17.